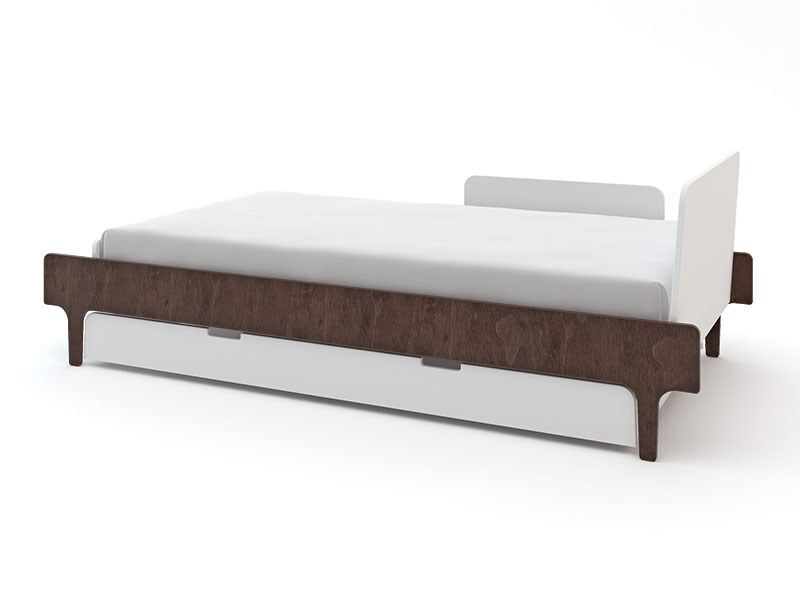 The River Twin Bed by Oeuf features clean lines and an awesome space-saving design. 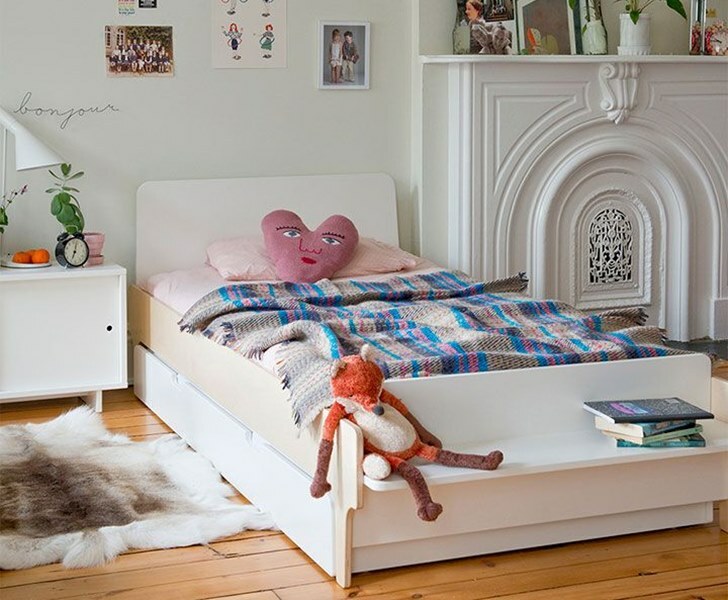 Kids will adore the little bench perched at the foot of the bed which offers a place to read, relax and play — or kids can use the bench to store toys, books or their ever-growing collection of dolls and stuffed animals. Sleepovers can now be pulled off with ease, even in a small bedroom thanks to the trundle bed, which tucks neatly away and can be used to store blankets and clothes when friends aren’t sleeping over. 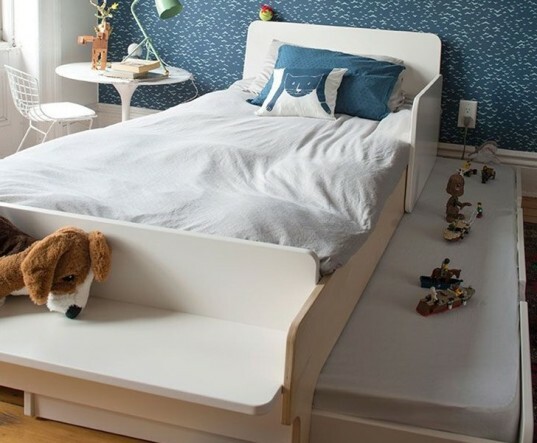 Toddlers can use this bed as well with the addition of a security rail that can easily be added to either side of the bed. Bonus, this bed is sustainable and made to last. Keep reading to learn more. As with their other furniture, Oeuf’s new River twin bed features smart and playful design elements along with sustainability. The bed has a low height for easy kid access. When paired with the trundle bed (sold separately) the River twin bed easily turns into a guest bed or can be used for extra storage. The bed is made sustainably in Europe in an FSC certified facility with Baltic birch plywood and finishes that are non-toxic, water-based and free of VOC health hazards. The entire piece is made under European environmental standards and all bed packaging is made of recycled cardboard. The bed fits a standard twin size mattress and can hold up to 225 lbs., making it a great choice for toddlers, kids and even teens. The River twin bed in walnut is available now and the River twin bed in birch will be available in early June. The River Twin Bed by Oeuf features clean lines and an awesome space-saving design. Kids will adore the little bench perched at the foot of the bed which offers a place to read, relax and play -- or kids can use the bench to store toys, books or their ever-growing collection of dolls and stuffed animals. Sleepovers can now be pulled off with ease, even in a small bedroom thanks to the trundle bed, which tucks neatly away and can be used to store blankets and clothes when friends aren�t sleeping over. Toddlers can use this bed as well with the addition of a security rail that can easily be added to either side of the bed. Bonus, this bed is sustainable and made to last. Keep reading to learn more.